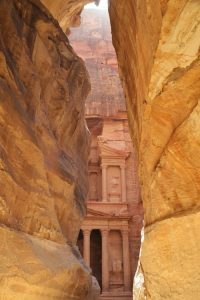 Petra is not only famous for its archaeological site. Once it was the capital of the Nabatean empire. Later an important city for the Romans. The caves have been used by the Bedouin. Now Petra is one of the New 7 Wonders of the World. A tourist attraction but also famous for the horses living there and working with the tourists. In Wadi Musa, a city close to Petra I had a meeting with someone for travelling. But it seemed fate had something else in mind. It is October 2010. 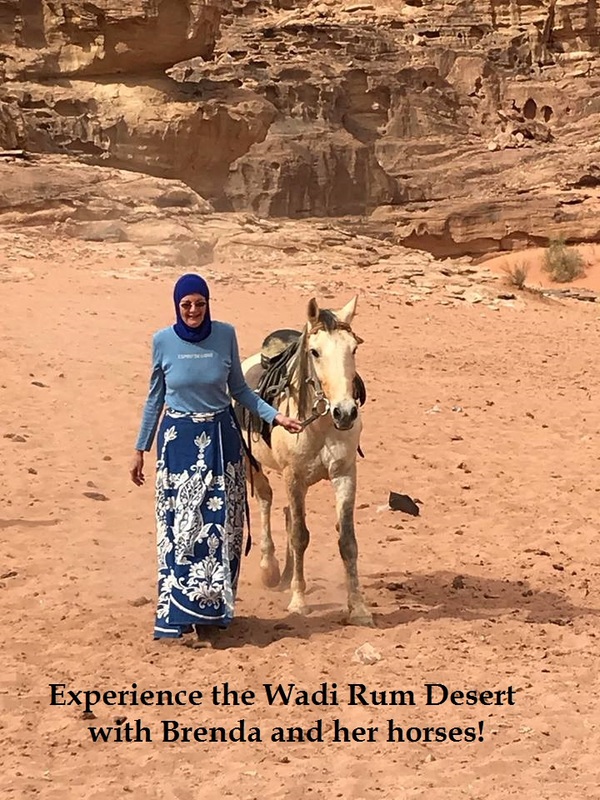 After researching and checking the road for horse riding for 25 people from Wadi Rum to Petra through the mountains we, Abdullah, abu Ayman, my son and I, arrived in Wadi Musa. I would stay there in a hotel for the meeting next morning while the others went back. I was tired, dusty and hungry, went to the restaurant next door and ordered a coffee and a sandwich. 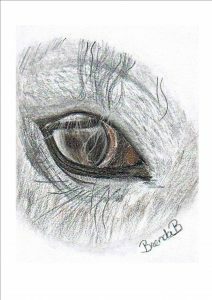 Meanwhile thinking about drawing the horse eye with pastel chalk of Samiha later in my hotel room. Someone was sitting behind me, after I finished my meal he started to talk with me. About horses and many other things. I liked his smile and his empathy for what I had been through and his concern. Next day we saw each other again at the travel meeting. In December I moved to Petra (Wadi Musa) to stay with him. My horse Samiha went first, 2 days later we followed with all the household, volunteers and 3 dogs. The dogs were the first problem, the home had a small garden but the dogs could escape through the gate. We kept them on the leach. Next morning two of them needed to go to Samiha, who was a bit down the hill in a sort of stable they build already before. Not specially for her, Petra has many horses working on the site. One dog escaped the very first night by biting his leach, the other one stayed. And I kept the Saluki in the home. From the visitor center to the entrance of the Siq, visitor’s can ride on a horse, guided by the owners, most of the time young guys. 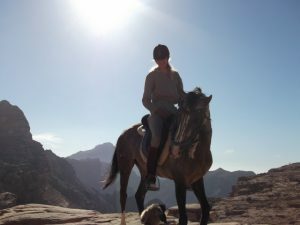 Actually the price of this horseback riding tour of a few minutes is inside the entrance ticket of Petra. The families who own the horses have a number to get a monthly fee from the entrance tickets, which will go to the family as a small salary. Goal of the boys (son’s of the family) is to get a tip from the riders to have their own income. Too little a tip is hardly accepted, they’ll go for the first prize and are only satisfied with a lot of money, they will ask for it. Other goal is to offer the riders a tour in the area or to the high place of sacrifice, in my opinion many times for prices too high. But once in a while they manage to trap the tourists . I allow everyone a fair income but it is not allowed to swindle the tourists. When I came to Petra I didn’t know about this yet, but when time passed I heard much that I cannot identify with. Brooke hospital was situated behind the visitor’s centre. All the horses in Petra, riding in front of the carriages were checked every day. Other horses could have a check-up when needed. The boys were taught about the necessary amount and type of food every day, how to take care for the hooves by doing farrier work, how to ride the horse well and how to stop abuse. In the following years the horses improved much. The horses were looking better, even the boys took better care of the saddle’s and reins, having beautiful decoration or had a friend abroad sending new horse equipment from their country. The Brooke also took care for the donkeys. Medicines were free as well as the veterinarian fees. The horses and donkeys were flowering under in the hands of The Brooke. Everything collapsed. The condition of the horses and donkeys took off although there were more private veterinarians in and around Petra, Wadi Musa and Um Sayhoun. Now they had to pay for a consult and the medicines, very different to when everything is free. For most of the people who could afford it, the money was not invested in good care of the horses and donkeys. They were just using their noble animals to work. Rather they needed the money for their own sake, to buy material stuff. Fortunately now Four Paws is looking after the horses and donkeys. We can see the horses and donkeys are already doing better. 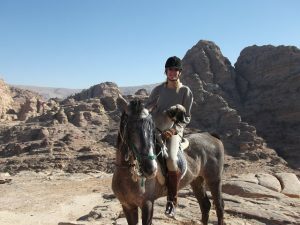 You can read the full article about the aid project to improve the health of donkeys and horses in Petra here. With Samiha and the Saluki Warda in the mountains of Petra. First I was happy to move to Petra, of all places this was the place to be. The ancient old city that the Nabateans cut out of the rocks. The story of Moses and Aaron, (the tomb of Aaron can be found on mountain Haroun), how Moses hit the rock and seven springs arose in the area, still possible to visit the one in Wadi Musa. I lived close to the site of Petra in Wadi Musa (spring of Moses). First in the village, later up the hill. Also Samiha moved up the hill and lived with other horses close to our home. I could visit her every day and make rides through the mountains of Petra. There were beautiful views but the path was a goat road you had to stay on, because the mountains were steep. Samiha loved to galop although risky on the winding paths. Hardly ever we met someone else except some shepherds of flocks with goat and sheep and some dogs, barking to protect their herd. Samiha got pregnant from the horse of the brother of my husband. It was already done before I knew. Confronted with this fact I was happy for her. She changed a bit. Busier with herself and less patient. But still comfortable to ride. She loved it to go out in the mountains. One morning the little brother came to me and told me Samiha lost her baby, because another horse was free and kicked her in her belly. I went to see her. We climbed down the hill where the dead premature foal was. A brown one, so beautiful, complete but dead. She only had to go one more month being pregnant. It was her first foal. What a loss, I was in pain for my dear horse Samiha. I couldn’t believe this. I took care of my lovely horse, she never became the same after this loss. Meanwhile it seemed it was the beginning of the end. Everything I tried to accomplish seemed to fail. With Samiha it went the same. But I was married now and had the commitment to make something out of my marriage. Next time about my visit to the Royal stables of princess Alia in Amman. Thank you Lisan, I appreciate your message and kind words much! It was a hard time in Petra for Samiha and me.